This is a description and an example of working with the Dharmadoor called Unification.This little article will first explain what Unification is and then there will be a transcription of a short session in Unification. When I use the term Self it is synonymous with pure consciousness. Formless, nameless, always present and relying on nothing outside itself. Also called the natural state. The mind is created when we think us separated from the whole. The mind is ego because it is the sense of a private entity called me. So the mind appears when consciousness identifies with a fragment of it and believes that it is this small narrow reality, which talks about an inner and outer world. When all conceptualisation stops for a moment the mind as a separated reality falls away and the Self shines as the only reality. This is also called the state of no-mind! There is a Zen story about a seeker that comes to the Master asking for guidance. The Roshi gives him a spiritual praxis and asks him to report back regularly about his progress on the spiritual path. After a short while the first letter arrives saying. “I am sitting in pure bliss”. The Master throws the letter in the waist bin. Another letter arrives after some weeks reading, “everything is beautiful and perfect”. The Master hardly reads it and throws it away. Again some time is passes and another letter arrives reading, “There is only oneness”, the Master doesn’t even open the letter. Long time is now passing and no letters, finally the Roshi writes the disciple reminding him about their contract. Again a long time is passing and no answer. The Roshi sends another letter. When the Roshi has nearly given up ever hearing more form the disciple a letter arrives with a short message, “who bothers”. In short, it is the feeling of being a stranger to life. It is the feeling of not really being involved. It is an alienated feeling. All spiritual longings are the effort to bridge this gab. When we dress this sense of separation with memories, values and ideas we have the ego- personality. When we believe that this personality is living in this particular body we become mortals. This is the fall that religious scriptures talk about, loosing innocence. I call it ego-sense because the ego is not real – having some substance that we can get hold of. It is made of thoughts, so it is made of the stuff that dreams are made of! That is why you can’t get rid of it. Many have tried down through history to kill the ego, to abandon or repress it. No one has succeeded on this path. How can you get rid of a lie? Trying to get rid of it just proves that you believe in it. You must “understand” that it is a lie. In the very understanding it is seen that it was never there. To overcome separation, the ego-sense, there are basically two approaches. The one of Self-inquiry and the one of Unification. 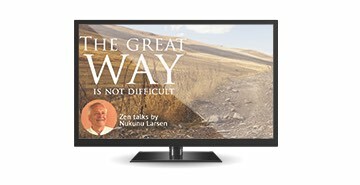 The first I have explained extensively in “The Great Embrace”. Here we shall embrace the approach of Unification. In Unification we take the standpoint from the very beginning that the ego is something that is superimposed on reality, a kind of after rationalisation. In a way we don’t consider it at all as having any importance. “In seeing there is only the seen. In hearing there is only the heard. All there is is the experiences there is no experiencer (ego). Sit for a moment, close your eyes and watch the mind. In this stream of consciousness is there an entity – ego, personality, which is not a formation of thoughts like the rest?. What is the difference between the content of the mind and the witness? Yes, there is none. The witness is also just thoughts. In Unification we don’t bother at all about the ego, not even if it exists or not. The main question in Unification is, “How is it to experience oneness with everything”. This question is a koan. A koan is a question that has no verbal answer. If you get the answer, which is not of the mind, you become the answer. The answer is your own deepest reality. The answer is who you are and you are that which is expressing itself in all there is and ever was. Ramana Maharshi would treat everybody: beggars, sadhus, ministers, crows, monkeys, cows and dogs equally, because he saw everything as an expression of the one reality that he called the Self. In unification you dissolve the sense of I into the experiences moment to moment until the truth so to say takes over and it becomes effortless. All there is is what is experienced moment to moment. A continues process of names and forms, which we call experiences. When the I goes, the idea of an inner and outer world also goes. It needs an I to have an inner and outer world. What is left is consciousness. Life is the movement of consciousness. Death is a change in this movement. No one dies because no one ever lived. “But how is cognition possible if there is no knower?” How can there be knowing if there are only forms and names changing in an endless process? All there is is consciousness. Consciousness can move-it is called manifestation-the world. Consciousness at rest we call the Self. Remember they are not two. It is like you can’t see the stars during the day. It is not because they are not there! The same with the Self because you don’t see it it does not mean that it is not there. The realisation of consciousness at rest –the Self is a knowing that nothing ever happened. When consciousness moves the first that is arriving is “I am” with, the “I am” arises the world. There is an impersonal dualism. It must be the way a newborn baby experiences the surroundings. Slowly the baby learns to identify with the body and memory and in this way the ego sense is born. I am this body with these memories! In the state of “I am” there are experiences but no experinecer. With the arrival of the ego the experiences becomes personal. When you go to bed and fall asleep after a while dreams start to appear. In the dream you may be negotiating a big valuable contract! What does it mean? It means that there is a dream character and a world she is living in, including other people and buildings- a whole world. Is it really the dream character that is negotiating a contract? Consider it carefully; it can wake you up if you really see the implications. The dream character believes she is real. She is signing a contract and believes she is responsible! Is it really like that? When the alarm clock rings, who is it that wakes up? Is it the dream character that wakes up? No, it is another reality that penetrates the dream. It is the reality of the “dreamer.” When the dreamer arrives on the scene the dream character becomes unreal. The dreamer- you create a whole world every night, actually an unbelievable act! That you are identical with the Divine becomes very obvious every night. The dreamer was dreaming the whole dream without any problem, in the same way the dream of life is being dreamed. We are as egos dream characters in the dream of life. We don’t realize that unless we wake up from this dream. The cosmic dreamer-the Self is dreaming this world, you and me and everything. She is dreaming the object and the subject, the knower, the process of knowing and the known. It is not the ego that becomes enlightened; “no one” has ever become enlightened. When Enlightenment happens it is the Cosmic Dreamer-the Self that realises that it was lost believing it was the “the dream character”. It is like the shift you do every morning when the alarm clock rings and you realise, I am not the dream character, I am the dreamer. The knower, the process of knowing and the object of knowing is all played by the cosmic dreamer- the Self. But beware; the self is not an individual or a soul. The self is beyond time and space, in short beyond the thinking mind but it expresses itself-manifests it self in time and space. The mind is an expression of the self as everything else is! I can hint at this Self by asking you the question. You wake up in the morning and remember the dream right? So there must have been something present in the dream, which is not really the dream, something that has been awake throughout the dream! That fact points towards the Self. This must be realized. It is not enough to know it in concepts. Only to know it in concepts is to get stuck with the menu and not enjoy the full meal. To get your toes into the real you must dissolve the separation between the knower and the known. How do you do that? By unifying your self with every experience. Don’t go into the laptop-the mind, which is the old habit: something appears in the mind and you immediately start to analyse it. That will not help. No mind gymnastic will help. It is about being what is as it is moment to moment until the awakening happens. With awakening you realise your natural state, which is effortless. You see it is not allowing any separation to take place. The old habit of the mind will separate you from your experience by starting to solve the problems. It is amazing how the mind can go on life after life believing that it can solve anything. It has never solved anything and still it continues…. The mind will go into the laptop and produce thoughts from the past. You may be distracted by the analyses but you don’t solve anything. This is unification at the very basic level. Don’t stop and settle with any content of the mind. In this way every content can be your realization. You can’t experience oneness with thoughts. They are too fleeting. Ask, “How does it feel when I am thinking these thoughts?” If you are worried, you cannot experience oneness with the thought “worry” you must make it felt, feel it in the body! You must have heard that the body is a condition for awakening. To realize our self we have to take bodily incarnation. This is one of the reasons that the body is such a gift. The body is the playground for enlightenment because it gives you a solid wall to play up against. You can also look at it this way; if there was no body there would be no senses and no perceptions. You would have no names and forms and the paradox is that when you enter every form and name you will realize the formless. It is by entering the senses and feelings – into the body that you can realize, “I am not the body!” That is unspeakable joy, but that joy is not for the people that are scared of being the body, that are scared of their feelings and physicality. These people will talk about not being the body but you will not feel any joy because they are afraid of the body. They reject it! They have started to live somewhere in the aura, trying to avoid all the things they have rejected. They know that if they dare to come into the body they will have to feel all the things they have escaped. One of the goals of NDT (non-dual therapy) is to help you back into being the body and that is often to embrace rejected feelings and memories that are stored in the body. Many people start dying –leaving their bodies long before the body falls away by itself. Unification is the path of love. It is insisting on no separation. We have learned to separate ourselves through our conditioning and everybody does it so it seems to be the normal state. The whole world except a few are living like that. Stop… and ask yourself, “What is it I will have to experience to come into the present moment? Often we are not present, but moving around in the mind. What do you feel and experience this very moment? Say welcome to it and be it! Rest totally into it just be intimate absolutely. Ask your self now, “How is it to experience oneness with this?” Investigate, how is it actually to be so intimate with the feelings and sensations in the body/mind that there is not even space for any separation. Enlightenment is total intimacy with life. Let the intimacy be so total that you disappear! Continue like that until you are free. When there is no me separated form the experience, there comes a space that contains neither doubt nor no doubt. All these concepts have no relevance in the natural state. It is doubt-less state, a state of no concepts and discrimination. It is the pure empty mind. It is extremely comfortable. When you touch it, you will know that the personal journey is over.